Weekly Photo Challenge asks what Off Season means to me. 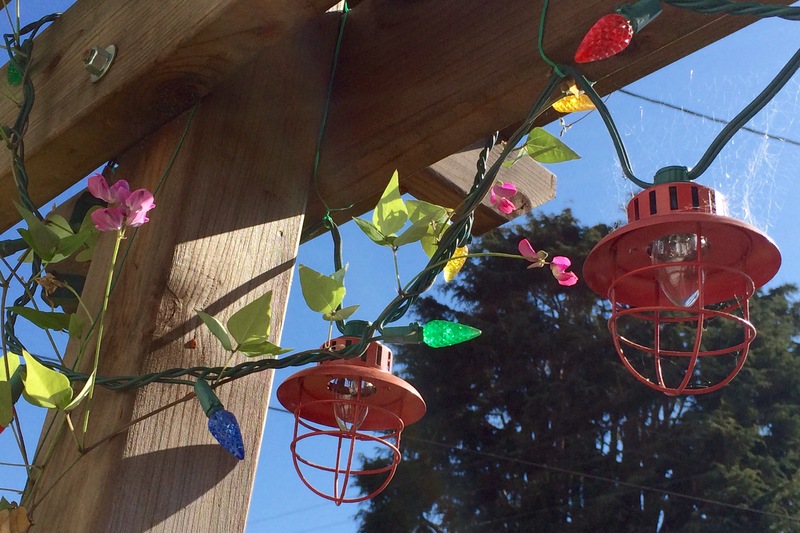 I didn’t think I had anything because California has so little season changes, THEN I remembered that the sweet pea we planted to festoon the front arbor has insinuated itself onto the Christmas lights so it seems we are stuck being those people with Christmas lights up all year round. Kinda pretty don’t you thin??? This entry was posted in flowers, Gardening, Photography, Visions and tagged Christmas lights, Gardening, nature, Photography, plants, sweet peas, weekly photo challenge. Bookmark the permalink. We’ve still got ours up. They add sparkle to dull days and a bit of oomph if we have visitors, especially if we’re eating. Unlike California we can have very dull, depressing winter days, so anything that adds cheer is welcome. Haha. Is that because you particularly like them, you’re a super early Christmas decorator, or because you didn’t take them down?! Why not? 🙂 Merry Christmas! Perfect! And you are not alone. We had our Christmas wreath up till early summer one year because a robin built a nest on it. Come to think of it I should go find that photo for this challenge! Anyway, I linked to this so my readers can smile with you. Thanks for passing this post on. How charming having a nest in your wreath.